"Tyler Ludlum went from being a healthy 10-year-old, looking forward to the pool, to an emotionally and physically traumatized preteen who'd traded both of his feet, and half the fingers on his right hand, for his life. It could have been prevented if he — or those around him — had been vaccinated." (Vaccination rates drop, putting more kids at risk, MSNBC, 11/21/2010) Stories of children being maimed or dying (10 infants dead in California whooping cough outbreak, CNN, 10/20/2010) are becoming more frequent and the blame belongs to fear of vaccination as much as it does to chance contact with microbes. Some of the blame is due to ignorance. Many adults don't know that the immunity from some vaccines (like the one for pertussis) can wear off and booster shots are needed. Some don't realize that vaccines are not 100% effective. Some don't know or don't care that many susceptible infants cannot be vaccinated because they are too young or not healthy enough, and their only protection is isolation and herd immuity from living amongst the vaccinated. Most states in the US have laws that allow parents to opt out of vaccinations for their school-age children, often for "religious" or "philosophical" reasons (Mississippi and West Virginia are the only exceptions). Many educated adults believe, incorrectly, that natural contagion provides better immunity and less danger, so they purposely expose their children to communicable diseases like chicken pox, measles, and rubella. (If you follow the previous link you will find a list of 25 diseases preventable by vaccine). Diseases that once caused havoc and misery to thousands of children and their families are being revitalized by the anti-vaccination movement. Some things are clear. Vaccination rates are dropping and outbreaks of diseases that have not occurred in decades (and should not be occurring now if recommended vaccination schedules were adhered to) are occurring in places one might least expect them to: Ireland, England, and California, for example. Why, given the success of science-based vaccination programs to eradicate so much misery worldwide over the past few decades, are so many people choosing not to vaccinate their children? The answer is the epitome of irony: fear of harming their children is the main reason parents are not having their children vaccinated. The vaccines are given to reduce harm, but they are refused out of fear they will do harm. We are not talking about a specific fear that a child is likely to have a devastating reaction from a vaccination, but a general fear that some children might be susceptible to some molecules in a vaccine that might cause severe and permanent brain damage. How did this fear arise? and how justified is it? are just two of many questions Seth Mnookin asks in his new book, The Panic Virus. 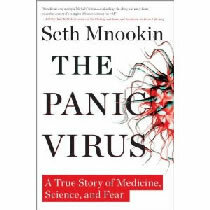 Seth Mnookin's inspiration for writing this book about various beliefs concerning vaccinations and the role fear plays in determining those beliefs seems to have originated with the realization that many intelligent people base some very important beliefs on intuition and feeling rather than on evidence and logic. After studying the evidence regarding the connection between vaccines and developmental disorders, he asked himself the question skeptics from H. L. Mencken to yours truly have been asking repeatedly: why do so many people believe, as Mencken so aptly put it, "in the palpably untrue"? I will warn the reader that though I highly recommend Mnookin's book, he didn't find the answer to that question. As would be expected, Mnookin's book repeats several heartbreaking stories. There's the family whose child gets Hib because she wasn't vaccinated; the mother's chiropractor warned against it. (In addition to diphtheria, measles, whooping cough, and the swine flu viruses, Mnookin covers Haemophilus influenzae and the Hib vaccine. This bacterium is not usually harmful, but if it gets into the bloodstream it can cause permanent brain damage.) There are the parents whose children have a diagnosis of autism or some other developmental disorder. There's the severely disabled child who's wheeled before judge and audience at the Omnibus Autism Proceedings. There is the child who dies because she's infected with the whooping cough virus, probably thanks to some other person who wasn't vaccinated. In addition to the volatile emotional element of these stories, another element that complicates the picture is how we deal with being wrong. Some of us dig in even deeper when confronted with strong evidence against our beliefs. Some of us change our minds. But there doesn't seem to be an easy way to predict how any of us will react to evidence and argument. We show two equally intelligent people the same evidence and present them with the same arguments, but we don't always get the same reaction. The same piece of evidence is given little weight by some people and tips the scales for others. I wish I could understand why Barbara Loe Fisher, Lyn Redwood, or Jenny McCarthy continue to believe that vaccines cause autism, when the evidence overwhelmingly supports the view that there is no causal relationship between the two. Mnookin's book reviews their stories, as I've reviewed them over the past decade, but he's no closer to understanding their intransigence than I am. Mnookin details the sordid history of Andrew Wakefield, as I have, but he's no closer than I am to understanding the continued attractiveness of Wakefield to a certain segment of the autism community. The best either of us can come up with is the notion that Wakefield and other liars offer hope, and false hope is better than no hope at all. But I don't think the desire for hope can explain why so many people in so many polemical battles (not just those involving autism) make stuff up at will, distort evidence as if it were expected of them, make unfounded accusations about the motives of their opponents, and invent claims they say are shown by the evidence their opponents bring forth when in fact they're just the opposite of what the evidence shows. The persecution gambit is so common it's laughable, yet it continues to work at some reptilian emotional level. When caught manufacturing evidence to promote a view that he hoped would lead the medical establishment to ban the MMR shot (so they'd be forced to use the shot he had a patent on), Wakefield charged others with persecuting him. He told the press that he was just responding to families and children in need. He is a martyr and would do it again if need be. When caught falsifying lab reports and receiving money to produce evidence lawyers could use against drug manufacturers, Wakefield never responds to the evidence. He simply accuses others of persecuting him and of not caring about the little children. As he is clearly hoping to pocket millions from a patent he's taken out on a single-virus shot to replace the triple-virus shot he set out to discredit, he accuses the drug companies of caring only about money and he accuses the medical establishment that continued to find fault with his work of being more concerned with maintaining the status quo for their own benefit than they of caring for the health of the poor innocents who would suffer because their martyr would be taken away from them. I imagine a group analogous to Wakefield’s supporters lavishes praise on Bernie Madoff (he was just trying to help people, doncha know). I'm sure Mnookin asked himself more than once why he was bothering when it is apparent that there is a growing segment of society that is oblivious to evidence and either doesn't know how to evaluate arguments or doesn't care what the arguments demonstrate. He might have tried the Mooney gambit and blamed the scientists for not communicating better with the public, but Mnookin blames the media more than any other group for the growing adherence to error and indifference to evidence and argument. The media certainly deserve a large share of the blame, but the public, the scientific experts, the drug companies, and the deceiving liars like Wakefield deserve a share as well. Let's deal with the scientific experts first. There was the inconvenient truth that sometimes vaccines had proved harmful, even deadly. The fear of being straight with the public about the possibility of contamination of vaccine serums led to some public relations disasters. Also, many experts were claiming they knew there was no harm being caused by ethylmercury in vaccines even when they did not know the half-life of the substance (how long it takes for half of the stuff to vacate the body, which is 10-20 days for ethylmercury and 70 days for methylmercury), nor did they have any standard by which to measure whether there was some amount of ethylmercury that, if accumulated over time, was harmful. The data is now in and the experts were right, but they had no way of knowing in the beginning that the increased number of vaccinations that became standard practice over time did not reach some dangerous threshold. In any case, it shouldn't matter now that most vaccines no longer contain thimerosal and many anti-vaxxers have switched to speculating that there is some other molecule of something that is in vaccines that is harming some children who are uniquely susceptible. There is no defense to that charge. There's no evidence for it, either, but that doesn't seem to bother the anti-vaxxers. The media and the general public made little effort to distinguish between methylmercury and ethylmercury. Mercury is mercury. Right; and both sodium and chlorine can kill you, but sodium chloride is table salt and non-lethal in small doses. The comparisons between the effects of mercury poisoning and autism were contrived and superficial. Then there were the media distortions, some done in good faith apparently. A fairly typical scenario emerges. It was played out in "Vaccine Roulette," an Emmy-winning program hosted by Lea Thompson in 1982 that she said would save babies' lives but which in fact probably led to several deaths. The special was about the DPT vaccine and the alleged harm it was doing. Her focus was on the pertussis part of the vaccine, the part that immunizes against whooping cough. She said she'd been investigating the subject for a year, but it seems like she wasted her time because most of what she said was wrong, deceptive, or misleading, according to Mnookin. Thompson's bottom line was that the vaccine was not safe or effective and that it caused brain damage, mental retardation, and permanent neurological damage. This is America, of course, and we value free speech, so Thompson's right to make stuff up or do shoddy research and put in on an NBC affiliate is all legal, etc. Philosophically, I suppose, the argument against her is to fight speech with speech. The only problem is that hardly anyone bothered to check out her story and offer a rebuttal. Here's a major rub: the American Medical Association (AMA) produced a line by line analysis that showed Thompson's mistakes and misrepresentations: quotes were taken out of context; she relied on inaccurate statistics; her interpretation of independent research was warped; and "there were unfounded claims so laced with conditionals and so lacking in specificity as to be essentially meaningless." She "misstated the titles, history, and affiliations of the sources she relied upon to make her case." But of course the AMA would say those kinds of things. When asked about the challenges to her work, Thompson responded in a fashion that we now recognize as typical: the critics are just trying to protect their turf, keep their power, keep the truth from the public, and harm the babies she's trying to save. Like Wakefield after her, she would not respond to the specific inadequacies that critics had exposed. Rather, she would take her fight to the public arena where rhetorical trickery trumps evidence and argument with predicable comfort every time. One of the biggest fallouts from the "Vaccine Roulette" program was that it caught the eye and mind of Barbara Loe Fisher who knows how to put two and two together to get five and had an aha! insight experience regarding the cause of her son's developmental disabilities: it was that DPT shot he'd received 18 months earlier. She now remembers that it was on that day that her son showed his first signs of trouble. But, as Mnookin notes, it seems incredible that Fisher, daughter of a nurse, granddaughter of a doctor, former writer at a teaching hospital, and very intelligent woman, didn't respond more proactively when her son allegedly started showing these signs of disability shortly after getting his DPT vaccination. "How was it that her only response to finding her unresponsive son displaying symptoms associated with heart attacks, strokes, and suffocation was to carry him to bed and leave him alone for six more hours? And if Chris's reaction to his fourth DPT shot was so severe that it transformed an ebullient boy into a sluggish shell of his former self, why had he been fine after receiving the first three doses?" Fisher has gone on to be a leader in the anti-vaccination movement. Most of The Panic Virus covers the anti-vaccination movement from Thompson's "Vaccine Roulette" through the Andrew Wakefield fiasco. However, there are several other chapters that serve as background and contrast. There are a couple of chapters on the history of small pox and its eradication and a chapter on polio and the polio vaccines. There are also chapters on fluoridation of public water supplies and something called Morgellons syndrome. The term was invented by Mary Leitao in 2002. It seems to describe a variety of skin conditions already known to medical science, including delusional parasitosis. For some reason, there is no mention in the book of the bird flu panics that arise from time to time. The Morgellons syndrome episode exemplifies the power of the Internet in spreading panic, creating confusion and uniting like-minded people who otherwise wouldn't even know of each other's existence. [update: see Morgellons: A hidden epidemic or mass hysteria? See also Still more evidence that Morgellons disease is most likely delusional parasitosis by Orac] Without the Internet, for example, Lyn Redwood would probably not have come to the conclusions she came to about mercury and vaccines, nor would she have found others ready to join her, form an organization, and spread the word. Jenny McCarthy admitted on Oprah that she went to the University of Google. Obviously, the Internet can be a fantastic resource for good, but it can also be a resource for harm, especially when used to confirm one's biases and to avoid doing real research into complex causal matters. Commercial television, on the other hand, with shows like Oprah and Larry King Live are almost always resources for spreading falsehood and harm in scientific and public health matters. An entire chapter is devoted to the February 26, 1998 paper by Wakefield et al. in The Lancet. Hindsight makes it clear that Richard Horton, still editor of the journal, never should have accepted the paper for publication. That he did so over the objections of those who reviewed the paper regarding Wakefield's research and reasoning, makes the case for not publishing even stronger despite Horton's labeling the paper "Early Report" and requiring a rewrite that made clear the speculative nature of the work. The study involved only 12 children, had no controls, went against the well-known fact that millions of children had been vaccinated for measles with no significant issue of bowel problems or behavior disorders standing out, irritable bowel syndrome was well-known and not specific to autism patients, and autism had been around long before the MMR vaccine was introduced. Dozens of expert critics called Wakefield's speculation "biologically implausible." As one critic put it: Wakefield's report wasn't a house of cards because there were no cards to begin with. The fact that The Lancet published the paper despite its obvious flaws is no excuse, however, for the way the media ran with the story as told by Andrew Wakefield. There was no way for Horton to know how Wakefield would co-opt the press and the public at his first press conference, called to bring attention to a possible connection between bowel disorders and behavioral disorders, but used by Wakefield to call for an end to the MMR vaccination program by suggesting the vaccine was causing autism. He had no evidence for the claim, but he speculated that some children's immune systems couldn't handle the vaccine and the result was IBS and autism. When challenged, he resorted to the now familiar tactic of not responding to the specific evidence against his claims and accusing his critics of protecting their turf and not caring about the little children as he did. Wakefield's lament has become the lament of Jenny McCarthy and dozens of others in the anti-vaccination movement: we must listen to the patient and the patient's mother. The implication is that those who consider only the science are not practicing good medicine. Unfortunately, the other implication is that those who ignore the science and go with their gut feelings are practicing good medicine. They aren't. They're practicing deadly medicine. The Wakefields, McCarthys, Redwoods, and Fishers of the world have a lot of blood on their hands. I've heard it said that you can't reason a person out of a position she didn't reason herself into. This belief is used to justify not trying to reason with someone who believes something palpably untrue. Yet, it seems clear that McCarthy, Redwood, and Fisher (as well as others like David Kirby, who comes in for a scathing dressing-down by Mnookin) have reasons for believing what they do. I've already mentioned Fisher's reasons. They're contrived and don't seem plausible, but it doesn't seem impossible that Fisher would one day be able to see that even if they were true, they aren't sufficient to warrant belief that a vaccine caused her son's disorders. Redwood made a similar leap to a causal connection between vaccines and her son's developmental disorder when she started reading about mercury online and saw parallels between her son's behavioral problems and the effects of mercury poisoning. In 1999, she associated thimerosal and her son's disorder and has been unable to disconnect the two ever since. But it seems that it should be possible for her to see that the effects are quite different and that even if they were similar, the evidence shows that the thimerosal isn't to blame. Mnookin, like many others, appeals to cognitive dissonance to explain why Redwood and her allies won't change their minds. To me, the appeal to cognitive dissonance is a conversation stopper. The expression basically says: it's irrational, don't bother trying to understand why this person won't change her mind no matter what the evidence is. Well, if there's no hope of getting the anti-vaccinationists to change their minds about the safety and effectiveness of vaccines, then there really is little hope that books like Mnookin's will have much effect. We must be able to show that public health is a vital social concern and that things like providing basic medical care, safe and healthy air and water, and providing vaccines that are safe and effective, are not optional luxuries, but necessitated by the fact that there are now about 7 billion of us on the planet, and very few of us are totally isolated from interactions that can have global effects. After reading The Panic Virus, I saw the movie Temple Grandin and began reading Grandin's Thinking in Pictures, Expanded Edition: My Life with Autism [Kindle Edition]. Grandin's life has been well documented, so I won't go into details here. Suffice it to say that she is a highly functional person with a Ph.D. in animal husbandry and many design accomplishments to her credit in the area of treating cattle and slaughtering them. She believes that had she been diagnosed by today's standards when she was two years old, she would have been classified as autistic. As an adult she is classified as having Asperger's. She is clearly an enigma and not a typical anything, much less a typical person with autism or Asperger's (whatever that might mean). One of the more fascinating things about Grandin is that she thinks in pictures, both still and moving. She describes her memory as being a kind of library with video clips she can access and view internally and manipulate at will. Abstract concepts must be constructed with pictures, not words. Unlike low-functioning developmentally disabled persons, she is linguistically fluent. Words trigger images in her mind, but she is able to speak, read, and manipulate words as well as, or better than, those of us who are highly educated but "visually illiterate" and would not have made much of a living in this world had we not been good with words. Grandin has read much of the literature on autism and has met with many autistic people and their parents. She has concluded that on the autism spectrum continuum (which, depending on who you consult, includes a variety of labels I won't go into here), there are people who think in pictures like her and have varying degrees of success with understanding words; there are those who have sensory processing difficulties of various kinds; and there are varying abilities involving connections between parts of the brain. From these notions, she's developed some advice for parents regarding the best ways to work with their children to develop whatever talents they might be capable of. For example, as a child she did not like to be touched by other people. This dislike of being touched or hugged, which must tear at the heart of every parent with such a child, is a common feature of those children who are diagnosed with autism. But in her case, when a teacher would grab her chin and move her face so she could not look away, it led her to learn to focus and not seek distraction. She believes, however, that this technique would not work with some children because of their different sensory wiring. Despite the fact that there is good evidence that the notion of learning styles is bogus, it may be that Grandin is correct in identifying three distinct learning styles among those diagnosed with developmental disabilities on the autistic spectrum: visual thinkers (like herself); music and math thinkers (those who think in patterns); and verbal logic thinkers (those who think in word details). In any case, her main point of teaching to the child's strengths rather than focusing on deficits seems like a reasonable proposal. Grandin's advice to parents is somewhat nebulous in that she advises them to try many things, and keep the ones that work and discard the ones that don't. Both Grandin and Mnookin mention Applied Behavioral Analysis (ABA) as a method that has had more success than others with autistic children, especially with effective teaching methods to get speech started. (Wikipedia and some other Internet sources refer to ABA as Applied Behavior Analysis.) Grandin advises parents to follow their instincts in seeking schools and treatments for their autistic children, but her notion of a "mommy instinct" is quite different from that of Jenny McCarthy or Oprah Winfrey. The celebrities advise parents to follow their gut feelings about complex causal matters: if you flash on a picture of your child getting a vaccination and then flash on his behavioral problems and flash on the one causing the other, then believe it. Grandin knows from experience that if she linked images as being causally related based on contrived or intuitive associations, she'd never have survived. What Grandin means by following your instinct is to use your common sense when evaluating a claim that a program is working for your child. If your eyes and brain tell you that your child is doing worse in some program, while the one selling and running the program is trying to convince you of the great progress your child is making, believe your eyes and brain rather than the "expert." McCarthy and Oprah, on the other hand, think that if all the science shows no connection between vaccines and autism, but your instinct tells you that your child's autism was caused by a vaccination, then go with your instinct and reject the science. Grandin's advice is useful in many areas. McCarthy's is likely to be harmful whenever and wherever it's applied. Finally, both Grandin and Mnookin mention Mark Grier and David Kirby, strong advocates of the mercury-causes-autism claim. Grandin simply lists them as sources of this "speculative" notion, but she offers no counter-evidence or sources that have shown the improbability of the idea. Mnookin rips to shreds both Grier (and his son) and Kirby for their shoddy research and arguments. The Huffington Post and the ongoing fear that vaccines might cause autism by Seth Mnookin, Scientitic American, Feb 11, 2011 David Kirby uses a similar rhetorical trick [to that used by Andrew Wakefield when he alluded to the debate over the MMR vaccine as he was himself starting that debate] in today's Huffington Post, in an article titled "The Vaccine-Autism Debate: Why It Won't Go Away." In the six years since Kirby published his book Evidence of Harm: Mercury in Vaccines and the Autism Epidemic - A Medical Controversy, he's become one of the main reasons this "debate" won't "go away." He's promoted the theory that vaccines might cause autism on Don Imus's radio show, he's appeared on Larry King Live, and he's debated public health officials on Meet the Press.